With this macro you can replace your transformation docker as speed up your workflow. It also includes many useful additional features. For X7 only. - no need to ever check a proportional box. Just enter value where you need it and press tab or enter. - hold shift to adjust shape size live with spin buttons. - SE (Size each buttons) - Sizes every item in selection in a batch. 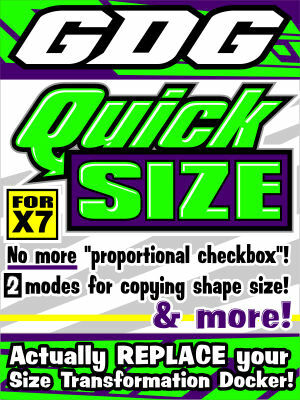 - 2 convenient modes for copying shape size. - option to auto run macro at start-up of Draw. - macro remembers form position on the screen. - modifiable value for increase / decrease spin buttons. - ability to round values to any decimal place . - quick change document unit. -World scale / Document scale view mode. View all sizes at once. -New in version 1.1: Click W or H label next to the proportional sizes to make the active selection square. -New in version 1.1: Double click main form or image in info form to fix any errors with your application events being disabled. Application events always need to be enabled for this macro and possible macro errors in other macros you use could possibly turn them off. New in version 1.3: Added ability to quick auto hide form if nothing is selected. Also...See movies and picture below.